Hero Baby standard 3 is a growth milk for your toddler from 10 to 12 months. Hero Baby standard 3 is easy to digest and contains prebiotic fibres, nucleotides and important fatty acids DHA/AA, all nutrients that you need for his or her toddler growth and development. Each box contains 2 Hero Baby standard 3 foil packaging à 400 grams. To you 200 ml milk to make growth los 6 measuring spoons of 5.5 grams of powder on in 180 ml warm or cold water. Are the unopened foil packaging approx. 2 year shelf life, after opening you need to use the contents within 4 weeks. 1 mix Hero Baby standard 3 growth milk is sufficient for 26 bottles of 200 ml. Hero Baby standard 3 growth milk contains all the nutrients your toddler needs to grow and develop properly. The growth milk is easy to digest and contains prebiotic fibres, nucleotides and contains the important fatty acids DHA/AA. 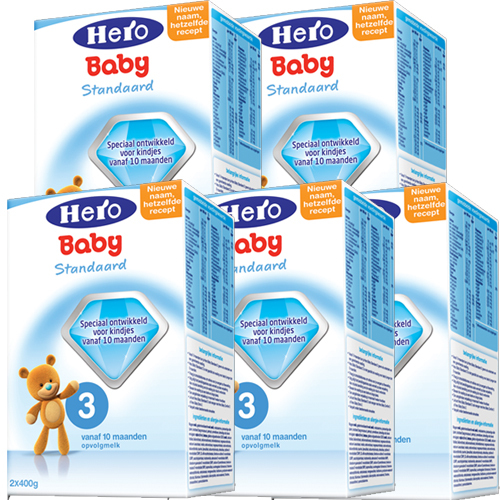 Also contains Hero Baby standard 3 iron and vitamin d. Hero Baby standard 3 growth milk is intended for children from 10 to 12 months and contains all the nutrients your toddler need into the right balance. Always first consultation with your doctor or clinic before you Hero Baby standard 3 are going to use. Once your child is 1 year you can change to Hero Baby Toddler milk 4. Hero Baby standard 3 growth milk contains no sugar or vanilla. Skimmed milk, corn syrup, vegetable oil, whey protein concentrate, galacto-oligosaccharides (GOS), emulsifier (soya lecithin), sodium-L-ascorbate, inositol, choline chloride, taurine, fish oil, ferrous sulphate, cytidine-5'-monophosphate (CMP), disodium uridine 5'-monophosphate (UMP), DL-α-tocopheryl acetate, zinc sulphate, L-ascorbyl palmitate, potassium hydroxide, adenosine-5'-monophosphate (AMP), disodium guanosine-5'-monophosphate (IMP), nicotinamide, disodium inosine-5'-monophosphate (IMP), manganese sulphate, calcium D-pantothenate, thiamine hydrochloride, cupric sulphate, retinyl acetate, pyridoxine hydrochloride, β-carotene, folic acid, potassium iodide, phylloquinone, D-biotin, sodium selenate , cholecalciferol. Added Nucleotides: AMP 0.54 mg, 1.8 mg CMP, GMP 0.36 mg, 0.21 mg IMP, UMP .71 mg. Kidney load: 191 mOsmol / l.